Help for women to understand men's spiritual needs, why today's church doesn't meet them, and how to successfully point them to God. Women don't understand men's spiritual needs but they want to and desperately need to know what they can do (and should not do) to keep their men engaged at church. In the follow-up to his bestselling Why Men Hate Going to Church, author David Murrow speaks directly to women to help them understand the real reasons men resist Christianity. He offers a way of talking about faith that intrigues men instead of repels them and then challenges them to bring more risk and adventure to their own walk with the Lord. About "How Women Help Men Find God"
David Murrow is the bestselling author of Why Men Hate Going to Church and director of Church for Men, which works to restore a healthy masculine spirit in churches. A sought-after expert and speaker on men's issues, he spent twenty years honing his skills as a communicator producing and writing award-winning TV documentaries, commercials, and specials. David has a degree in anthropology. He and his wife have three children and live in Chugiak, Alaska. Learn more at www.churchformen.com. 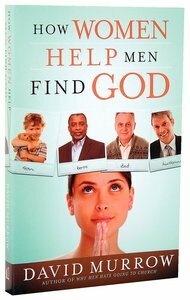 Customer Reviews For "How Women Help Men Find God"
Brilliant... 'man-up your church' and get the blokes involved! Great humour, fantastic insight and real practical advice. I felt like David really nailed what is missing to bridge the gulf between church culture and 'bloke' culture.. a big job ahead but great to have some great advice from a great blokey warrior for Jesus! All women who have anything to do with men..and who want to have any hope of getting men to know God.... should read this book!